If you've run out of milk, need a prescription, or finished all of your adult beverages, you most likely know where to go to buy these necessities. However, on Christmas Day, when nearly all businesses, including grocery stores, are closed in not only San Antonio but throughout Texas. If you don't have an emergency errand, perhaps you and your family want to eat Christmas brunch or enjoy dinner out, or maybe you're looking to get out of the house and do something fun on Christmas afternoon. If you find yourself in any of these situations, here is a list of what you can depend on being open on Christmas Day in Alamo City. If you run out of milk, juice, paper products, pain relievers, soda, wine, or liquor, you can get it all at your local Walgreens. You can also pick up a prescription at certain Walgreens locations on Christmas Day, so be sure to call before you go. 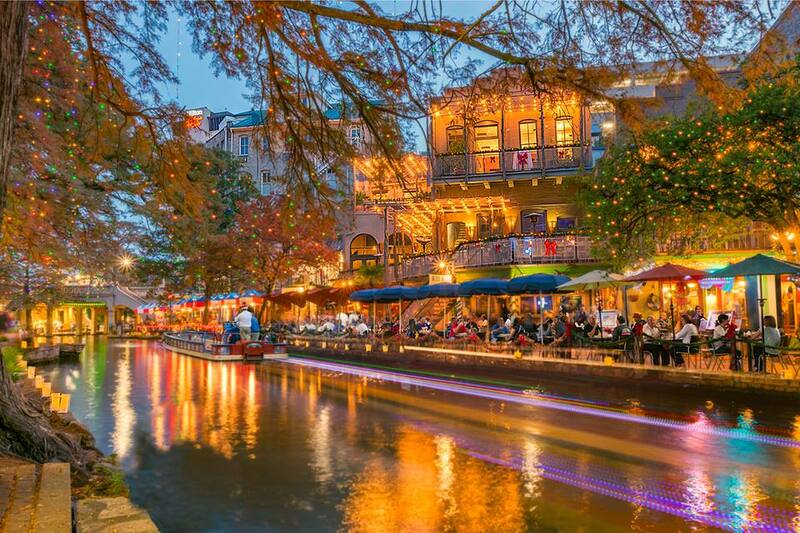 San Antonio's trademark River Walk is open every day of the year, and 24 hours a day. Although many of the restaurants and bars will be closed on Christmas Day, a stroll through the area if the weather is nice is a fun Christmas Day activity, where you and your loved ones can enjoy the twinkling holiday lights. Christmas afternoon or night is a splendid time to visit the San Antonio Zoo to experience Zoo Lights. You will be treated to sparkling lights, a Lakeside Lightshow, a crackling fire to warm up and roast marshmallows, and Santa's favorite, hot chocolate. You can also go ice skating or have the chance to ride on a camel like the Three Wise Men. Despite its name, Biga on the Banks is an upscale restaurant located along the River Walk. Serving an ever-changing menu of adventurous New American fare, you never know what will turn up on your plate, making it a fantastic Christmas Day surprise. Celebrate Christmas French-style at Frederick's Bistro. Voted as the Best French Restaurant in San Antonio by the Reader's Choice Awards, this bistro won't disappoint any day of the year. The Grand Hyatt San Antonio is just a short walk from the River Walk and is open all day on Christmas. For breakfast, lunch, or dinner, you can dine at Ruth's Chris Steakhouse in the hotel, and then make a stop at Bar Rojo for a specialty cocktail and enjoy a few small plates. It's become a tradition of sorts to go to the movies on Christmas afternoon. Hollywood has taken note and has released big movies on Christmas for the last few years. You should expect most if not all theaters to be open on Christmas Day, and whether you choose the homegrown ​Alamo Drafthouse, IMAX, or a traditional multiplex, you are sure to find a theater that suits you and your companions. Due to the popularity of this activity, you might want to reserve seats in advance for this favorite Christmas Day activity. Shahi is known for their low prices and friendly staff. Skip this market if you're looking for fresh produce, and check out their bakery department instead. Locals rave about the bakery department, and you will be a dinner hero if you arrive at your family's house with freshly baked bread. The Rustic is a fantastic live music venue that will ensure a rockin' Christmas Day party. Located in the in the heart of the Medical Center, this San Antonio mainstay has been offering a wide range of specialty food items since 1999. The Ali Baba International Food Market focuses on Middle Eastern produce, spices, halal meats, prepared dishes, and baked goods from a wide range of cuisines including Mediterranean, Iranian, Pakistani, and Indian, and well as some Eastern European items as well. Vegetarians and vegans, Himalayan Bazar is for you. Stocking everything from taro root to samosas, you can pick up a freshly prepared Indian dishes on Christmas Day as an insurance policy that you won't go hungry at a meat lover's house. The bazaar also sells jewelry and trinkets for last minute shopping and stocking stuffers. Larder stocks gourmet foodstuffs and prepared dishes to bring as a last minute addition to your holiday parties ​or enjoy all on their own. The market is attached to Hotel Emma, right in the middle of the happening Pearl District, where you're likely to find a bar or two open. If you are looking for dining options along the River Walk, make a reservation for Dorrego's Restaurant, located inside of Hotel Valencia, which remains open during the holiday. This upscale eatery focuses on the flavors of Argentina and is the only Argentinean-inspired restaurant in San Antonio. Appropriately named, Knockout offers hand rolled pizzas and low priced pitchers of beers, to bring a little Christmas cheer. If you're looking to have a casual Christmas with bar fare and brews, Mad Pecker Brewing is your best bet in town. Serving craft beer from local breweries as well as international, San Antonions rave about their wings, beer cheese fondue, and the lively atmosphere.